This is Day 8 of the 2017 edition of the 20 Days of Chill writing challenge hosted by P. J. at A ‘lil HooHaa. Today's prompt is Blue. Please visit the other participants for more stories. There are so many different directions to go with this one. I could write a blue poem, but I'm not feeling poetic at the moment. So let's look at what kinds of things are blue. The sky, the ocean, birds and flowers. 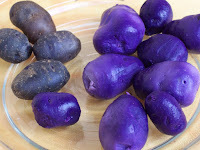 There is even a blue potato. How strange is that? Can you imagine a pile of blue mashed potatoes? There are blue gem stones and minerals such as sapphires, blue quartz, barite, beryl and many others. Nature is full of the most beautiful colors. We could take every color in the rainbow and find shades from the most gentle to the most intense. In Googling the word blue for this post, I came across this question. When was the color blue discovered? That's not a question I would have thought to ask given how plentiful it is in nature, but nevertheless, it appears to be a valid one because there is an answer. There is a whole wikipedia article on it, but here is a brief statement to it's origin. Beginning in about 2500 BC, the ancient Egyptians began to produce their own blue pigment known as Egyptian blue, made by grinding silica, lime, copper, and alkalai, and heating it to 800 or 900 °C (1,470 or 1,650 °F). This is considered the first synthetic pigment. I think we take a lot of things for granted in today's world of technology and general busyness. Maybe we should slow down just a bit and look around and admire not just the blues, but all the colors in the spectrum. Well, now. Who knew? The origins of blue. I like it! I certainly didn't. I learn new things all the time during these challenges. Thanks! I always learn something doing these challenge posts. I like to appreciate nature in their own colors but blue mashed potatoes? no thank you. No blue mashed potatoes for me either. (Dark) blue is my favourite color. I had no idea the Egyptians "invented" it, though. I had never thought about colors being invented. I should look up green - that's my favorite color. Blue is my FAVORITE color... and I love ALLLLL the things you named! That's the color of your truck, right? Blue Sparkle if I remember correctly. That is interesting about the first pigment of blue being created. It's just so taken for granted that blue has always been the color of "things". I figured colors are colors and have been around since the earth was created.